Who says working to help animals in need of assistance is a thankless job? Earlier this week, Cicero Barbosa and a few friends were out enjoying a day of boating off the coast of Mongagua, Brazil, when they happened upon a humpback whale who wasn't having nearly as good of a time. The massive animal, it soon became clear, had gotten tangled up in something that was making it tough for her to swim. "I think it's the third time I've seen a whale here, but the first time so close up," Barbosa told Brazilian news outlet Globo. "The coolest thing was we could help her. She had a net wrapped around her body and it seemed like she was asking for somebody to take it off." Sure, the men could have easily continued on their way, hoping the situation would resolve itself. But did they? They aren't the type to leave a whale hanging. Instead, they searched until they found where the net was looped around their new friend, and cut her free. That's when something pretty incredible happened. "Afterward, the whale stayed there, showing off for us," said Barbosa, "like she was saying thanks." The men were stunned to watch as the whale lingered around, happy and free. 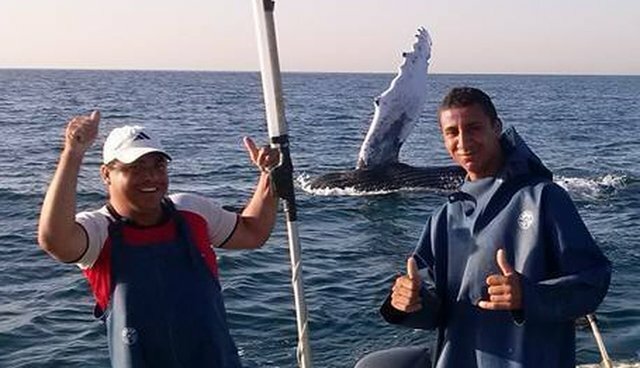 At one point, in perhaps the greatest expression of gratitude to the dudes who helped her, the enormous mammal even joined in on a post-rescue photo - seeming to mimic the mens' hand-gesture with the whale equivalent of a "thumbs up." The remarkable scene of interspecies unity didn't end there. As the helpful men started to head back after their job well done, the whale whose life they saved even bid them on their way with one last appreciative wave.